Thanks to our ever-connected world where pretty much anything can be accomplished with a laptop and WiFi, companies can collaborate with workers around the world just as easily as they can with in-office staff. So, it’s not surprising to see an increase in virtual/remote/distributed workforces in companies across a number of industries. Plus, when teams open their (virtual) doors to around-the-country or even global candidates, it gives them access to a huge pool of talent that otherwise would never exist. Why limit your workers within a certain geographic boundary if you don’t have to? These five companies asked that same question and, in doing so, have embraced virtual workforces–many of them even have 100% distributed teams. And the best part? They ALL are currently hiring remote/virtual/telecommute team members. Note: Need a little extra help to kick your cubicle to the curb? Grab me ebook, The Ultimate Guide to Finding a Full-Time Remote Job. It’s on sale over at Gumroad and priced and whatever you want to pay! InVision is a powerful design and prototyping tool. It transforms static screens into real-working, interactive, and clickable prototypes. Did I mention it’s free–forever? Twitter, Evernote, MailChimp, Netflix, and Zendesk are just a few of the well-known InVision fans. Who says you need to move to work at a great company? Not us. We know there’s great talent all over the place and we are a completely distributed company. Do great work from an environment that you’re comfortable in. They also have a commitment to learning and personal and professional growth. InVision has many remote positions available, my favorites include Customer Success Manager, Deep Thinking Product Designer, and Marketing Copywriter. To work at Edgar is to be committed to their company philosophy. It also means you get to call an octopus your boss. Check out their Careers Page for current job openings and available internship opportunities. We are 100% remote and believe in building a world where developers can have access to an environment of growth and incredible opportunities regardless of where they live. Our culture is based around the proactive, selfless values that make up every X-Teamer. If you’re a top-notch, extraordinary developer, there may just be room for you in X-Team’s community. They also hire Ambassadors to recruit and attract the amazing aforementioned developers. Ambassadors and Developers alike should all have superhero qualities and get excited about making positive changes in the world. Everyone works from their own home or office, and we’re spread out all over the world — United States, Canada, Ireland, Scotland, Japan, Iceland, Bulgaria, Australia, and more. Automattic embraces the timezone variances of their workers rather than viewing it as an inconvenience since it allows them to operate pretty much 24/7. Working for Automattic lands you some pretty amazing benefits like coworking allowances to help keep you sane when working from home, an open vacation policy, and company-sponsored life insurance. Sound good? Community Organizer, Theme Wrangler, and Happiness Engineer are just some of the opportunities there are to become an Automattician. Upworthy is committed to providing the best online content without all the filler and fluff–no click-bait headlines here, folks! Their curators scour the corners of the internet to help bring attention to things that actually matter (humanity & culture, diversity & equality, environment, and health, to name a few). These irresistible issues get shared on the Upworthy Community and take off from there–50 million people are engaged each month with some of the most important content thanks to Upworthy! Work from home, from a coffee shop, from a coworking space — anywhere with good enough Internet to do a Google Hangout. Go move to Montana for a month and work from there if you want. (And if you already live in Montana, keep on living there!) There are no remote workers here; we’re all part of a distributed team. You also get a vacation stipend, flexible scheduling, and free no-deductible health insurance. Upworthy just may have the key to work happiness by allowing team members to make a meaningful contribution to the world (that you also happen to get paid for!). Check out the Upworthy Careers Page for a list of current openings like Growth Editor, Designer, and Account Executive. These five companies are taking the reins when it comes to fully embracing remote/virtual/distributed workers. And I’m sure, in years to come, we’ll see more and more companies offering home/office/anywhere work options to promote employee happiness. After all, it’s no secret that happy workers = happy customers and that’s a win-win any way you look at it. Want to know where you can find even more great distributed workforces? Check out the 10-Second Commute for advice on how to land a work-from-home career with a credible company. Don’t forget to like Work from Home Happiness on Facebook to learn about even more great companies that let you work wherever you want! This post may contain affiliate links. Please see the disclosure for more information. Hi Anita! Thanks for stopping by. It is an intriguing concept to work whenever and wherever you want. It will be interesting to see how many companies adopt this mindset in the future. Hi Ashlee! I love this post so much. 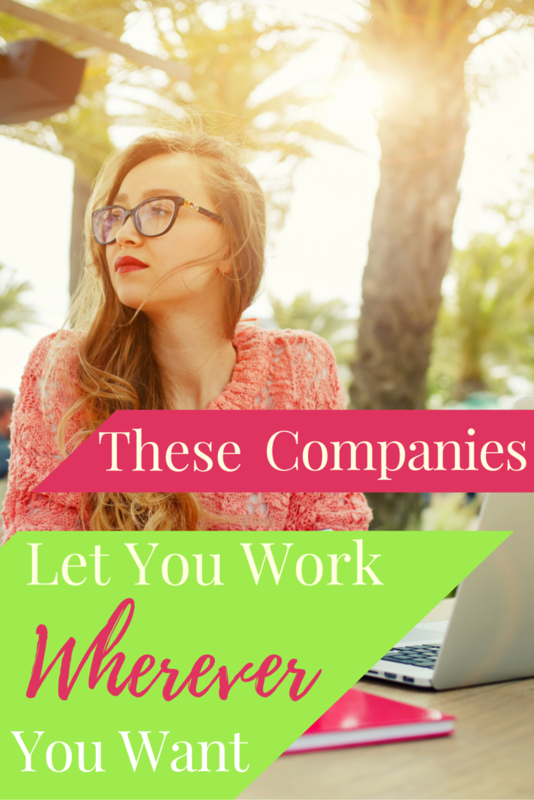 I keep a running list of these companies and am definitely going to look into adding a few I see here that I have no idea let people work remotely! Thank you so much for sharing! Wow it’s gr8 . I am from Pakistan. Will there be any opportunity for me? Many of these companies listed have employees all over the world — your location is not as important as your skills and experience. So, if you are qualified for the job, it doesn’t matter where you live. Be sure to check out all of their current job openings to find out which one is right for you. Good luck! Checking these out now. Than you for posting! Great post thank you for sharing I m be checking opening. Omg, I came across this blog and I appreciate you for sharing all this information. I really needed it. Thank you for sharing. Take care. Hello Ashlee, I have only recently come across your website. I have looked, researched, and studied a mountain of material that people have out there…..and seriously what I heard from most all of them was blah blah blah blah blah…and seemed to be more confused after I read what they had to say. You have the most awesome site…and I have spent 2 days reading articles and can’t wait to get to the next article. You are wonderful and you go that extra mile to sincerely help people with their, “needing a second income” or their “dream to become a writer” or both. I only wish I could have found you about a year ago. A million thanks for all the valuable information. You’re wonderful. Keep up the good work. Thank you for stopping by! Your kind words have just put the biggest smile on my face. Really, thank you for taking the time to share them with me — it has truly made my day. I have found work happiness in being able to make a living remotely, and know others can experience the same happiness. But, I also know it’s not always an easy road to go down and it can be harder still to just get started. Thank you for this great post! I agree with Donna, your site is absolutely awesome and wish I could have found you a long time ago! It seems that there are a lot of online or stay home jobs for people with in the the topper equator. Is there any jobs available for the Pacific Islanders? Hi Ashlee. Thanks for all this info. I have been finding a job from home, but didn’t get to the right one. I shall try one of these jobs very soon. This is a good resource! I will keep this in mind!